Pineapple (Ananas comosus) is a popular tropical fruit that belongs to the Bromeliaceae family and is mainly grown in Asia, Africa and South America. Organic dried pineapple is a superfood snack made ​​from pure, unheated pieces of organic pineapple that have been hand sliced and sun dried in order to retain as many of the valuable nutrients as possible. Organic dried pineapple contains zero flavourings, colourings, preservatives or any other artificial additives and is instead bursting with beneficial ingredients including natural fruit sugars, vitamin C, the essential trace element, manganese, and the natural enzyme, bromelain. Indeed, just one small handful of organic dried pineapple is equivalent to one of your recommended five daily portions of fruit and vegetables. Deliciously sweet and chewy, organic dried pineapple is a particularly healthy snack between meals and a perfect treat for both children and adults alike. In addition to enjoying your organic dried pineapple straight from the bag, try cutting up and combining with organic nuts and other dried fruits and berries of your choice for a tempting trail mix, or use as a colourful topping for breakfast cereals. 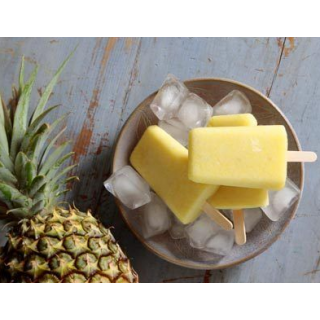 Alternatively you can use organic dried pineapple as an exotic ingredient in raw chocolate, cakes and desserts, including our yummy pineapple popsicles below. This recipe requires popsicle moulds. First add the fresh pineapple, organic coconut juice and the organic coconut palm sugar to your blender and blend until nice and smooth. 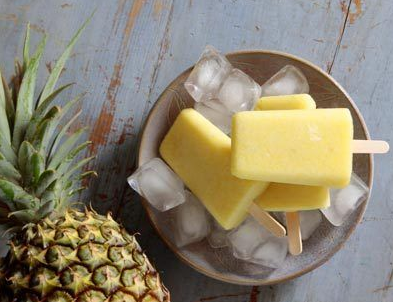 Next cut the organic dried pineapple into small pieces and place into your popsicle moulds. Lastly fill the popsicle moulds with the pineapple and coconut mixture from the blender. Place into your freezer and leave to set.